Smart cards are the flexible plastic, and size of the credit card that contains silicon integrated circuit chips to store and securely transact the data. Smart cards have multiple advantages from storing data to storing cash. Multiple companies have evolved in China for the manufacturing of smart cards such as Shenzhen China smart card tech, co. ltd, which deals in multiple card products. Smart cards are also an important component in the era of IoT, which is in developing phase in China. The establishment of smart cities and quick adaptation rate of the technologies are the major factors driving the growth of China smart card market. Smart cards enable quick access and quick ID verification in multiple places such as in the transport system, payments, hotels, and restaurants. The transforming economy of China with the expansion of manufacturing industries, infrastructure industries, and hospitality are major application areas of smart cards. For example, the smart grid in China will be facilitated by the smart cards in electricity payments from the customer end and on the service provider end for controlling the access of persons in the restricted areas as the multiple component smart cards provides need-specific solutions like fingerprint sensor, rewritable magnetic stripes, and others. The European Chamber of Commerce has joined with the Smart Card China Desk in multiple fields that are expected to influence the growth of various tech industries. Goldstein Research analyst forecast that the China smart card market is set to reach USD 15.26 billion by 2025, growing at a CAGR of 7.71% over the forecast period (2017-2025). Contact card accounted for the largest market share of 54.7% in 2017. Over the forecast period, the contactless card is expected to surpass the contact card market share on the back of the developing IoT environment in China. The report covers the present ground scenario and the future growth prospects of the smart card market for 2017-2025 along with the market players’ analysis. We calculated the market size and revenue share on the basis of revenue generated from major players in the China region. China smart card market is forecasted on the basis of smart card production supply and agricultural produce. China smart card Market Outlook 2017-2025, has been prepared based on an in-depth market analysis from industry experts. The report covers the competitive landscape and current position of major players in the China smart card market space. The report also includes Porter's five force model, SWOT analysis, company profiling, business strategies of market players and their business models. 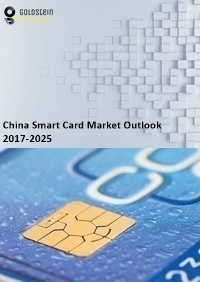 “China Smart card Market Report” also recognizes value chain analysis to understand the cost differentiation, pricing models to provide a competitive advantage to the existing and new entry players. Our China smart card market report comprises of the following companies as the key players: ZD Technology Co., Ltd., Zhongyuanda Smartech Co., Ltd., Max Smart Card Co., Ltd., JHCD Technology Co., Ltd., D.C. Corp., Green Card Co., Ltd., Infineon Technologies, NXP Semiconductors, Samsung Semiconductor, STMicroelectronics.